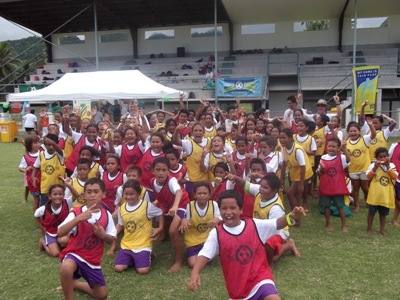 Since it’s inauguration in 2011, Just Play has reached over 1300 children from the age 6 through to 13 in the Primary Schools and community organizations here in the Cook Islands. Since then the popular program has spread its wings to two of the outer islands, Atiu and Aitutaki while two training courses have taken place here on Rarotonga with many festivals celebrated in the past two years. Project Manager and Just Play Instructor Michelle Paiti will be conducting the two day workshop with theoretical and practical with the important aspects of Just Play. “Some of the trained teachers/facilitators have moved on from previous schools or have moved overseas, so more of our teacher will be trained to deliver Just Play to our children,” says Paiti. In addition two teachers who are waiting for their ‘ride’ back to Palmerston will also have the chance to experience the thrills of Just Play, furthermore, the Just Play program will then be taught to the children on their home island. “This is exciting for the progression of Just Play, especially when it is difficult to travel to the northern parts of the Cook Islands,” says Paiti. “I believe that the children on Palmerston will thoroughly enjoy the activities outlined in the Just Play manuals, I look forward to the updates from these two teachers,” she says. Just Play Kits full of equipment required for this programme will be presented to the new facilitators to allow them to continue delivering the programme throughout the next six weeks and beyond. Developed by the Oceania Football Confederation social responsibility and technical department, Just Play is designed for children aged six to thirteen and promotes physical activity while encouraging community involvement and healthy living. “We would like to acknowledge the continued funding of this programme from the Australian Government (AusAid), UEFA and Oceania Football Confederation (OFC),” says Paiti.